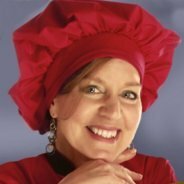 Hi it's me again, I have a Cake Stackers question. I had asked you a couple of weeks ago about gold piping gel. Well I found all the piping gel I need thanks to you. Now, I have one week to complete this stressful task. 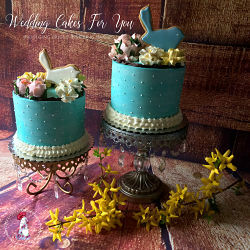 I am excited to do my first 3 tiered cake and I want it to be perfect. This is my business card, so to speak. Anyway, I think I messed up.I ordered the cake stacker in the 6, 10, 14 sizes. Ok I just baked my cakes in the exact same sizes. Was I supposed to get a larger (16in) size for the bottom layer to sit on? Now I am frantic over this. My Cake Stacker Support system won't be here til Wed. and the cake has to be delivered on Sat. 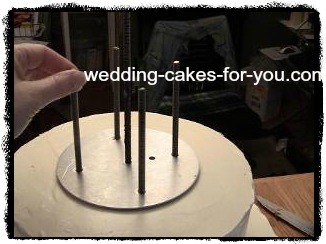 Yes I am sorry to say you will need the larger 17 inch Cake Stacker base for the wedding cake. The ten inch and 6 inch will be fine for the middle tier and the top tier. Call them on Monday morning and tell them what happened, they can probably ship it to you quickly. If not you can use the wooden dowel system if you have to. If you need more help just come back and ask. Its OK to bake your cakes in the 3 inch high pans. Just fill them as if they were 2 inch high pans. If you try to fill them too much the cakes may not bake up as nicely. You can trim them down a little if they are too high. 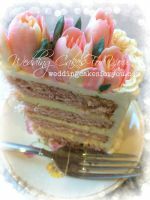 Wait until after you get your cakes onto the Cake Stackers System before you decorate them. 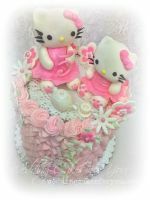 Follow the link below to the photo album on my Facebook page with pictures of one of my cakes using the support system. 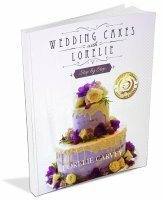 You will also find tutorials on the Cake Stackers website. You will need them the first time around. Did you order the cardboard rounds that go with them? I would advice doing so. They have holes punched in just the right places. You will understand when you see them. Good luck. I know how stressful it can be. 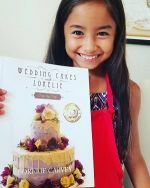 I am here and so are other helpful cake decorators willing to help you out. According to the Cake Stacker site if you order a 14 inch base then that base will be for a 14 inch cake. The measurement will really be 3 inches larger but it will be called a 14 inch base.